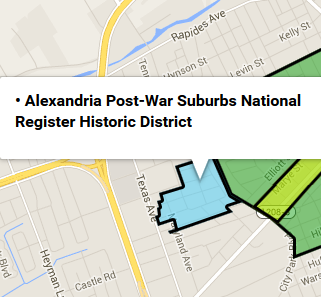 Here’s a little history about the development of the neighborhoods that are included in the Alexandria Post-War Suburbs. 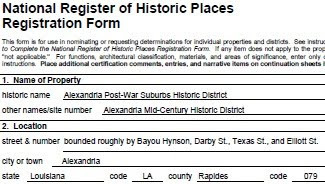 Most of the following has been extracted from the narrative of the registration form resulting in the 2013 listing of the district on the National Register of Historic Places. As is typical of post-World War II subdivisions, any given house is located roughly in the middle of the lot with a broad expanse of lawn in the front. The large lots with ample front lawns epitomize the escape-from-the-crowded-city concept that was much a part of the suburban rationale. In terms of designed landscape features, there are a notable number of period low planter boxes built of the same brick as the house. City directories reveal the pace of construction in the district. In the immediate post-war years, twenty-three houses were built. Clearly the period of intense construction was 1951-56, when half of the district's houses were built. Roughly one-fourth were built in the late 1950s/early 60's.